is it possible to have 2 presenters added to 1 slide? I love being to show our customers who is talking to them, but we have a lot of scenarios where multiple people are presenting - sometimes within 1 slide. 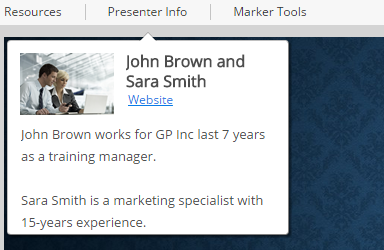 It would be fantastic, if the Presenter Info could show 2 people. I forwarded your request to our developers for consideration. Thank you for mentioning this! We appreciate your interest to iSpring programs!